While this pretty English gem began as an important deep-water port, it is now a favorite coastal escape for city dwellers. The home of the Britannia Royal Naval College, Dartmouth is steeped in military history, strategically located on the banks of the river Dart, and was once the sailing point of the Crusades of 1147 and 1190. It’s hard to miss the fortified castles perched at the mouth of the Dart—the Dartmouth and the Kingswear—with the small Tudor Bayard’s Cove Fort tucked behind as the town’s third line of defense. 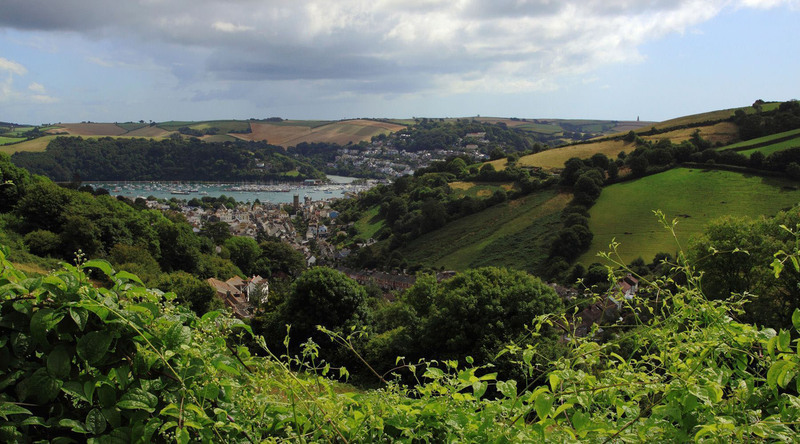 Visit Greenway, the summer home of author Agatha Christie, or stroll down the “Butterwalk”, a row of classic Tudor merchants’ houses built in 1635-40, now home to shops and the Dartmouth Museum. Arguably one of the most picturesque towns in England, Dartmouth’s medieval and Elizabethan streetscapes, smart boutiques, streetside cafes, and gourmet restaurants continue to charm. Explore the beautiful Georgian mansion and romantic garden and woodland, once owned by Agatha Christie, who called it the “loveliest place on earth.” The Christie family were great collectors, so Greenway features some amazing treasures, including archaeological artifacts, tunbridge ware, silver, china, and books. Tours of this iconic building will cover its considerable history and its role within the Royal Navy today. Tours are available on Mondays and Wednesdays, and booking is organized through the Dartmouth Tourist Information Center. Hike the Dart Valley Trail system, covering 16 miles along the beautiful River Dart, on a route crammed with gems and jewels of human and natural history.